The chaos that was the Los Angeles Lakers’ season reached a fitting apex Tuesday that seemed more reality TV than reality. But the drama that unfolded over the course of the Lakers’ final day of the season was indeed real. And it was more than LeBron James cared to deal with in public. 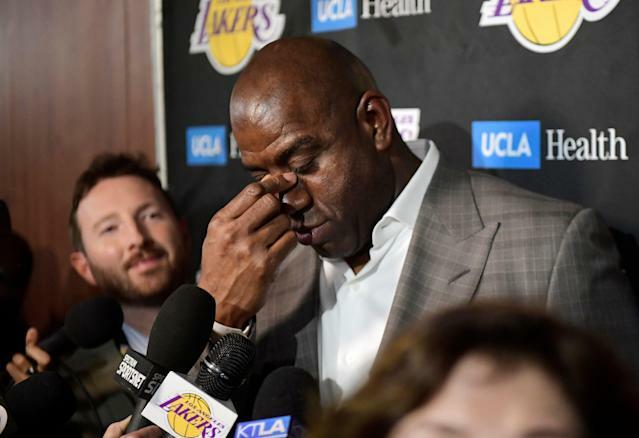 A day that started as a welcome end to a disastrous season that saw dreams of a championship foundation built around James devolve into a lottery-tanking nightmare was thrown into tumult overdrive when president of basketball operations and Lakers legend Magic Johnson preempted the season finale by abruptly announcing his resignation in an impromptu news conference. It was a stunning turn of events that nobody outside of Johnson’s inner circle saw coming. According to Johnson, even team owner Jeanie Buss wasn’t looped in as he chose to break the news to reporters before his boss. There was little time to process Johnson’s bombshell at Staples Center, as there was still the business of a basketball game to tend to, as meaningless as it was in Los Angeles. The Portland Trail Blazers were in town with playoff-seeding concerns on their mind, worries that long ago left the orbit of the Lakers. But as if handed down as one last kick in the groin from the basketball gods, the Blazers put the Lakers season out of its misery courtesy of a Moe Harkless 3-pointer that went through the net as the buzzer sounded to secure a 104-101 victory for Portland. Maybe it was for the best. Had Harkless’ shot missed, there would be at least five more minutes added on to this Lakers season that nobody who cares about the purple and gold wanted to see extended. What does LeBron have to say? The end of the game left one significant piece of media business left untended. What does LeBron James, the center of this turbulent Lakers universe have to say? James was seen in the street clothes that have come to define his maiden season in Los Angeles sitting next to his teammates during the game. With Johnson’s news coming so sudden, James had not yet had an opportunity to weigh in publicly. Reporters and NBA fans eagerly awaited his comments on the transgressions of the Lakers’ day. James was not as enthusiastic to provide satisfaction. According to Los Angeles Times columnist Arash Markazi, James did not address the media after the game. Markazi attempted to track James down for comment, but instead ended up with this video of James looking perplexed at his phone as his security team put distance between himself and reporters. “Crazy, crazy, crazy,” Markazi quoted James saying. It’s hard to blame James for wanting to leave Staples Center as fast as possible. He’d surely rather be spending time with his pal Dwyane Wade on his big night in Miami than dealing with the aftermath of the mess in Los Angeles that is partly his own making. This Lakers season went as poorly as reasonably possible, and things are seemingly on a path to get only worse before they get better. It’s a lot to digest. But James will have to address the story in public at some point. With the emotions of a difficult day still raw, it appears that James decided to put some time between the news and his response. With the end of game-related media obligations, James will take his own time to face reality in public.